If I would pick the best free and open-source internet television desktop client, it has to be Miro. This awesome application (previously called Democracy Player and DTV) is loaded with great features making the TV experience on your computer a lot more fun and exciting. 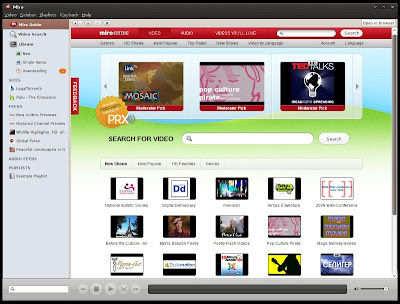 Miro can play or supports most known video files like Quicktime, WMV, MPEG, AVI, and XVID. But it's more than that, as it also has an integrated RSS aggregator and a BitTorrent client among others. Miro can automatically download videos (like perhaps your favorite podcasts) from thousands of available RSS-based channels. --A lot of them offer free HD videos. 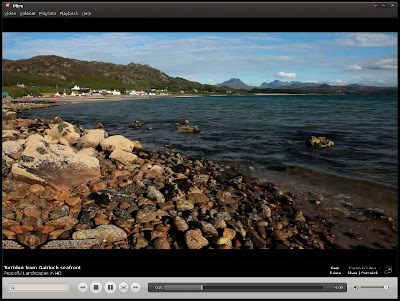 You can easily manage your downloads, or instantly play the downloaded videos on Miro's built-in video player. The integrated BitTorrent client is based on libtorrent. By default, LegalTorrents.com is bookmarked in Miro and can be seen at the sidebar. Miro by the way supports the adding of website bookmarks under the “Sites” category. Miro has a slick, intuitive, and user-friendly interface that looks rather similar to that of iTunes. To those of you who are new to Miro, you should start by checking on the Miro Guide and go on from there. Trust me; using Miro is as easy as ABC. You can change some of Miro's preferences by going to Video --> Preferences. To Linux users who want to download and install Miro, it is probably available on your distro's repository, so I suggest that you search for it, and then get it from there. If not, you can always go HERE. Hi! Are you interested in getting a logo / header / banner or template or SEO service like directory submissions or social bookmarking for no money to improve your site http://www.junauza.com. You no need to pay a single dollar for these services. This is a special “Promotional offer” from us. Approaching you through this form since I could not find out the email address. Please get back to me if you are interested. Miro is great we recommend it to our clients and no one ever seems to have a problem using it.